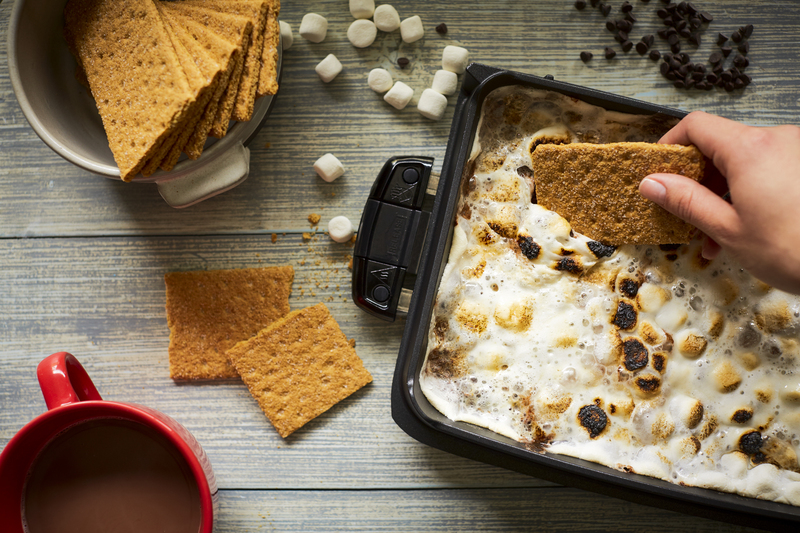 Less Mess: Turn the traditional messy s’more into an easy-to-eat dip with all of the traditional campfire s’more flavors. Attach top grill plate and bottom griddle plate to George Foreman Grill & Broil or Evolve. Preheat grill to 350°F. Add butter to preheated griddle plate until melted. Then, add chocolate chips in even layer. Place cubed cream cheese over chocolate chips and close lid. Bake for 8-10 minutes until chocolate and cream cheese are softened. Use back of spoon to smooth out chocolate and cream cheese and top with marshmallows. Carefully remove top grill plate to expose broiler, if using a George Foreman Grill and Broil. Or close the lid with the top grill plate still in place in the Evolve. Cook for 2 minutes, or HIGH broil for 2 minutes until marshmallows are toasted.